A MUST SEE HOME! This beautiful custom built Mediterranean home boasts amazing panoramic views of Bishopâs peak and Madonna Mountain. The 4,122 sq.ft home sits on 1/3 acre that borders Prefumo Creek, and features 4 bedrooms, 4 bathrooms, an office, and library. The floor plan flows and is open and inviting with tons of natural lighting. The upstairs master bedroom includes an en suite bath, walk-in shower, jacuzzi tub, balcony, and fireplace. Two additional upstairs bedrooms share a Jack and Jill bathroom. The large downstairs bedroom with an en suite bath and walk-in closet can serve as a living quarters. The view, and open and airy living spaces will make the homeowner at ease an inspired to entertain guests. Photos donât do justice to the craftsman finishes in this home, and must be viewed in person. Other features include spacious 2-car garage, large laundry room, central vacuum system, ample storage, and low maintenance landscaping. 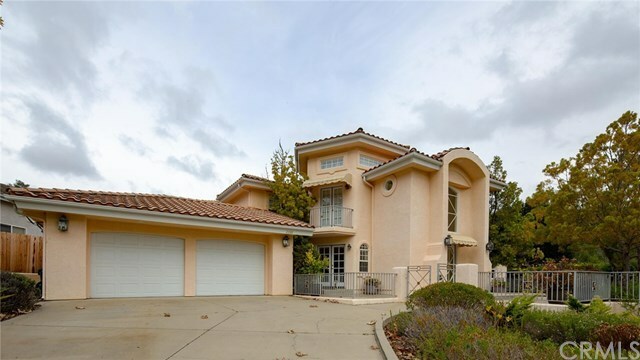 With easy access to everything that San Luis Obispo has to offer, the home is less than 2 miles from shopping centers, golf course, hiking trails, schools & much more.